I first came to Surrey during my undergraduate studies for a year abroad, as part of the Science without Borders program (Scholarship Award from the Brazilian government). Whilst here, I remember watching a lecture about researches going on at the University involving vitamin D and I was fascinated. I immediately fell in love with the topic and it got me wondering why we weren’t talking about such an important matter back in Brazil. I felt an instant admiration for those researches and an urge to learn as much as possible so that I could try to bring attention to this matter in my own country. This was my biggest motivation to apply once again to the Science without Borders scheme, this time for a PhD scholarship at Surrey. I was also drawn by the excellence of the university in terms of teaching, research and student experience, which I felt so keen to be part again. 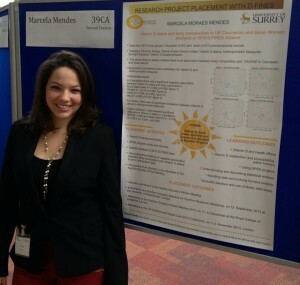 My PhD project will look at the interaction between vitamin D supplementation and sunlight exposure in Brazilian women living in a low latitude (where there is abundant sunlight exposure all year round) and living in a high latitude (where there is exposure to sufficient sunlight only during the months of April to September), using the same methodology. Data from this project will provide relevant evidence to consider new revisions on the dietary recommendations for vitamin D, especially in this ethnic group. Doing a PhD abroad, especially in such a world-renowned university, is an experience that could only be described as overwhelming, in a positive way! For me the most rewarding aspect of it is being part of such a multicultural academic environment and having the amazing opportunity to meet people with backgrounds and experiences so different from mine, with so much knowledge to share. For me this is one of the most enriching and helpful ways for us to grow, redefining our own personal and professional consciousness. I also hope my experience abroad will bring new research collaborations between Brazil and the UK, joining efforts and sharing knowledge to help improve the advance of Nutritional Sciences in both countries.